Religious leaders in the country have been urged to preach the message of anti-corruption given the important role they play in shaping the attitudes of their followers. 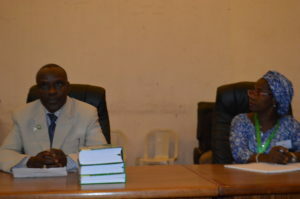 The call was made by the Acting Chairman of the Independent Corrupt Practices and Other Related Offences Commission (ICPC), Dr. Musa Usman Abubakar, during an education excursion by religious leaders from Lux Terra Leadership Foundation (LTLF), an inter-religious organisation to the Commission’s headquarters recently. Dr. Abubakar who was represented by the Director of Education Department, Baba Ashiru, urged the religious leaders to be actively engaged in the fight against corruption by using the opportunity of their positions of authority to always preach integrity messages in order to reduce the menace. The Acting Chairman also urged the Foundation to partner with the Commission’s own Religious Leaders Forum structure created since 2007 and Students Anti-Corruption Clubs in secondary schools aimed at inculcating sound moral values in the minds of the youths. Earlier, the Executive Director of the Foundation, George Ehusani, who was represented by Henry Ijomah, said that the visit to ICPC was a fact-finding one and that the group comprised Muslim and Christian leaders undergoing training. He added that they would be enlightened on how to use religious institutions’ networks and resources to fight the menace of corruption while promoting a culture of integrity in Nigeria. In a paper presentation on the overview of ICPC, Mrs. Ese. M. Okwong explained to the religious leaders the mission, vision and mandate of the Commission. For the preventive mandate, she said that “It is cheaper to prevent corruption than to cure it” and therefore urged the participants to play their role effectively in the fight against corruption.